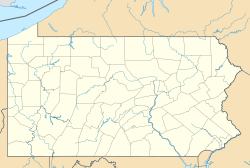 Bartville is an unincorporated community located in Lancaster County, Pennsylvania. It operated a post office during the 1870s and 1880s. ^ a b "Fertility". Geographic Names Information System. United States Geological Survey. ^ "Bartville Post Office (historical)". Geographic Names Information System. United States Geological Survey. Pennsylvania Geological Survey, 2nd series, HHH, xxiv, 348 p. illus. atlas, scale 1 in=2 mi. Gap Survey 1876: Mineral resources, railroads, locales, people, schools and churches.